But first, thank you to everyone who wished My Little Sailor "Happy Birthday." I think once he got his computer problem solved, he had a good birthday! Now I know you're accustomed to seeing a finished quilt, or at least a finished quilt top, on Fridays. This week, I have a tray full of cut squares to show you. The result of an entire day of cutting 2.5" squares and 3.5" squares -- and a very sore back! Gee, it doesn't look like much from this angle! Maybe a close-up? These are the squares for the very first Quilt Block a Day I'll be hosting on Facebook. Karen Snyder of AnnaLenaLand blog has offered a free tutorial for a different block each season for the past several years. She is retiring from the quilting business to enjoy her new part-time home in Sweden. And I am grabbing the baton to continue A Quilt Block a Day. 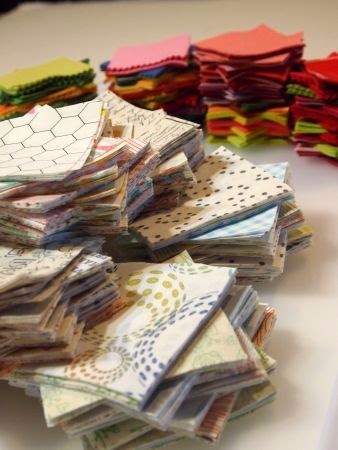 The theory behind B-a-D is this: "Don't have time to make a quilt? Surely, you can make one block each day!" We'll sew a single block each day during the Spring season. Then, when summer rolls around, we'll have enough blocks to make a nice full-sized bed quilt! If you belong to Facebook, go here to join the group. If you don't, not to worry. I'll be posting the tutorial right here on 52 Quilts in 52 Weeks on Tuesday. Come back on Tuesday to see the tutorial and join in A Quilt Block a Day! I actually thing that having a bunch of stuff cut motivates me to sew. I love that you are getting all ready with squares. I may have to cut a few things in advance. 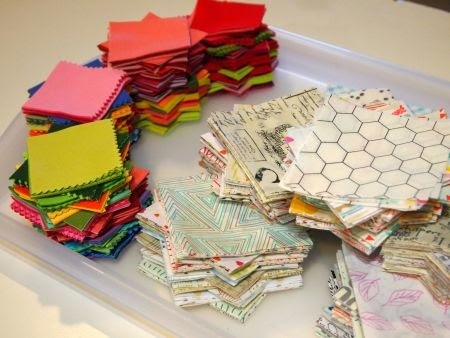 I empathize with the sore back from cutting squares...I remember well the day I cut all my scraps into squares. Your assortment of fabrics is interesting, and I can't wait to see what you do with them. There is no one I can think of to be better for taking the reigns of the block a day. Your eye for color and pattern is amazing, so I know the finished quilts will be too! Joy, careful, my head will be too big for my hat! I hope you'll join in the BaD project! Hmmm looks interesting! I'm not a big fan of cutting up lots of fabric all at once either. I tend to cut a bit and make some blocks then cut a bit more. The one time I cut all the fabric for a project at once it made one of my arms ache badly for ages so I take it a bit at a time now! Intrigued to see which block you decided on. Marti, is the ache across the top of your back ? Perhaps extending down to the shoulder blades? I too get a pain there that is very debilitating and hurts a lot considering it's usually an overuse injury. But, what helps it to heal safely and less painfully? Heat has been my friend; hot, in the shower or hot tub, ThermaPhore moist heating pad system-expensive yet worth eighty dollars; altho I have and take muscle relaxers I find them not to be very effective with this pain. Resting the muscle group may help, I seldom have the luxury of "not doing anything". Looking forward the BaD-I suspect it will be fun, imaginative and beautiful.